So I had this crazy idea the other day to make some kind of dessert/sweet hummus. I Googled dessert hummus and found out that it wasn’t so crazy and in fact many other like minded people had already figured out how to do just what I was thinking of. Thank you Google. I wasted no time in whipping up this recipe and taste testing it – the things I do for the blog! It was love at first bite. If you like the flavor of Snickerdoodle cookies – sugar and cinnamon – you will surely enjoy this slightly sweet hummus! The high powered Blendtec or a Vitamix blender makes this super smooth and creamy. If you don’t have a high powered blender – no worries- you can also blend this in your food processor. You would never know the base ingredient was garbanzo beans. Trust me on this one and give it a try. Serve this creamy, dreamy sweet hummus with some fresh fruit, it’s also good spread on banana slices ,quick breads like banana nut, whole grain muffins, toasted whole wheat bread, pita bread or home made pita chips. Make a sandwich on whole wheat bread with a little hummus, fresh apple or pear slices and a sprinkle of dried cranberries. I made one and it was so refreshing for breakfast. fresh grated nutmeg to taste – optional – but oh so good! Add all ingredients to a high powered blender or food processor and process until smooth. Store in the refrigerator. Mine turned out to be a thick hummus, you could add a little apple juice to thin it if you wish – I might do this next time. 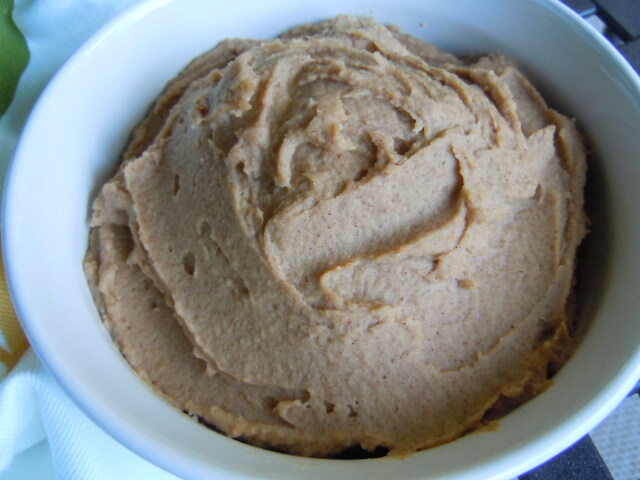 From photos on line I saw that some people had a thinner hummus from this recipe – must depend on the brand of the garbanzo beans or how soft they are. Serve spread on fruit, pita bread, toasted whole wheat bread or pita chips. I have been cooking up a storm around here.Yesterday was unusually rainy and cold here and chili sounded good so I made a huge pot of Engine 2 Three Bean Chili. Never did I think I would be telling you that I made a huge pot of chili in June! Of course I had to tweak it a bit with more seasonings and let it simmer for a few hours instead of the recommended 20 -30 minutes. Chili is better when it is allowed to simmer,the tomatoes break down more mellow out and the flavors blend together and develop. The result was a winner! The leftovers will be even better today and some will be frozen for future meals. Recipe coming soon. You know how I like to cook ahead – so while I had the kitchen in a mess I made up a double batch of veggie burgers. Once they cool I wrap them individually and put them in a freezer container. They can be reheated in the microwave for quick and easy meals. It’s much easier to stick with a healthy food plan when you plan and prepare food ahead of time. P.S. Chorizo Patties and Vegetarian Chili Burgers are two of our favorites. I will post soon about the recipe I used yesterday – it’s another good one! After all that kitchen time yesterday there is no need to cook today. Love that. My Grandma Gritz was a wonderful home cook and baker (one of my favorite people of all time) and for as long as I can remember she would to listen to a daily 30 minute radio show called Kitchen Klatter. It was a syndicated radio show directed at the homemaker. It aired out of Shenandoah, Iowa in the kitchen of the host who had other female relatives join in the conversation. They chatted about recipes, gardening, parenting and family. Grandma kept a notepad and pen nearby so she could take notes if they mentioned something she wanted to try, a product she should buy or a good hint about cleaning. Kitchen Klatter had their own line of products including a wide variety of flavorings that Grandma, mom and I also used. Grandma felt like she knew the Kitchen Klatter ladies and their families. When I would be at her house listening to the show with her she would fill in the gaps about what was going on with the family as the ladies chatted about current family events. Grandma bought a copy of their cookbook for my mother and myself. (She did pass along that love of cooking and baking to us.) This Midwestern style cookbook was a good resource for me as a new bride trying to figure out what to cook each night. 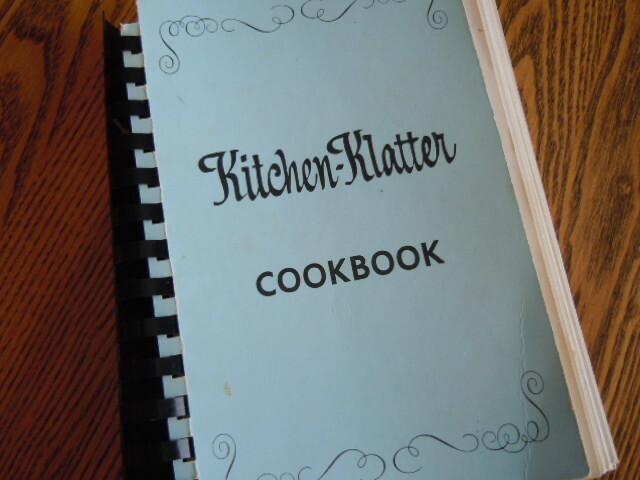 I don’t know why Kitchen Klatter popped into my mind this morning as I started to write about my day in the kitchen. It motivated me to dig out that cookbook and browse through it remembering some of the recipes I made and the few notes I wrote. Glazed Pork Chops had a big red star next to it with “good” written in the margin. I am naughty like that – I write in my cookbooks noting if we liked a recipe, what changes I made and what I would do differently if there is a next time! Grandma did the same thing. Then it dawned on me how much my blog resembles that radio show I grew up listening to with my Grandmother. Weekly I have the privilege of sharing my favorite recipes, food finds, family trivia and our hiking and biking adventures. I have gotten to know many of you who follow and read my blog and leave me comments or send me private emails. If you are also a blogger, chances are I am reading and commenting on your blog too. Together we have built a community much like the one my Grandmother was drawn to with her favorite Kitchen Klatter show. Although technology has changed how we communicate somethings remain the same, such as the need to reach out and find like minded people and be a part of a community. I think my Grandma would have loved Nutmeg Notebook! Thanks for choosing to be a part of my Kitchen Klatter. I’m glad you are here. Feel free to leave a comment or ask a question. 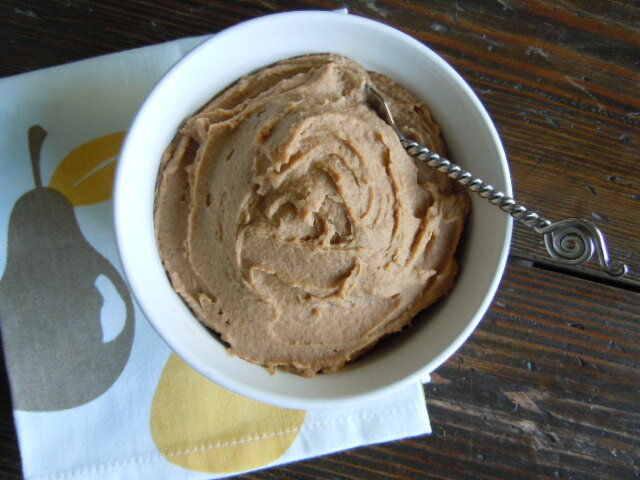 How would you choose to eat this Snickerdoodle Dessert Hummus? Have you ever heard of the Kitchen Klatter radio show? OH I LOVED your personal story Tami!!! Memories are so important! Loved the story and the term Kitchen Klatter! The hummus recipe is just what I’m looking for to take to an upcoming event. Something creative and different. I have never heard of Kitchen Klatter, but I love it! and yep, I totally write in all my cookbooks. I have a gazillion, so many times I don’t pull one out for years, and then I don’t really remember the changes I made to recipes…like I think I will, so writing in the margins really helps! I knew you would write in your cookbooks Renee! You are so right if it’s a recipe that gets long forgot there is no way to remember how you tweaked it or what you thought would be an improvement! And, yes, blogs are a wonderful way to get to know about what others do and like in the kitchen and about their lives. It’s a nice little community. Thanks for sharing! I saw that this recipe was pinned quite a bit on Pinterest! It’s so lovely and different and a dessert you can feel good about serving. I do like the little community we have going – nice little friendships have been made and it takes us beyond our home community. We have the opportunity to connect with people whom we otherwise would never meet if not for the internet. How cool is that? 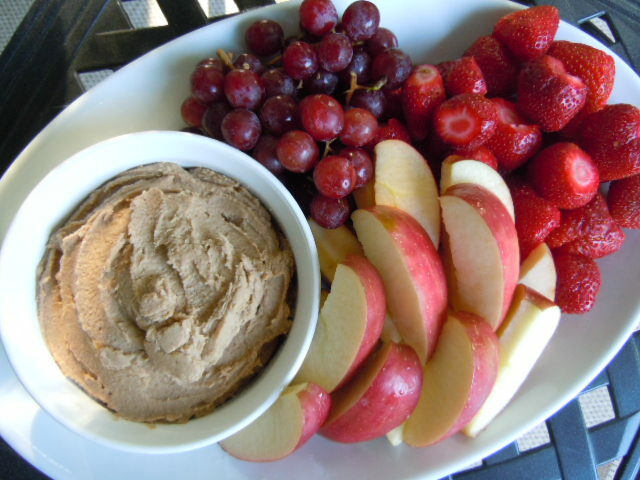 The dessert hummus sounds like a great idea, pinning to my list of recipes to try! It’s been cold and rainy here, too, in the Seattle area. I’ve been making soups and tarts, nothing too summery. I’m glad you are building and enjoying community with your blog, it’s not always easy to do! It’s fun to travel down memory lane with others – I have loved all the stories you have shared recently about your Grandfather. I knew this recipe sounded familiar, I made Evan’s cookie dough hummus last year and it looks like that’s where you’ve adapted this from. It was FABULOUS!! I like your modifications. Yum. And yes, the team members where I Work would LOVE this! Actually he came up with this version of dessert hummus but I subbed dates for the brown sugar and added fresh nutmeg to mine. So tasty! Great story! I too got my love of cooking from my grandmother. Many a day I would be in the kitchen with gma watching, working and learning. She never measured a thing – she was great fun! I too write in my cookbooks – always have. How else would I remember my changes and whether or not family liked it? LOL. God bless our Grandmothers and their love of cooking! Glad to know we are both writing in the margins of our cookbooks. 🙂 Happy Cooking Linda. Love the Grandma memories. Aren’t we fortunate to have known our grandmothers? So many recipes so little time to try them all Cammy! 🙂 I am so happy that I lived near my Grandparents and was able to spend quality time with them. They are some of my happiest childhood memories. LOVE the Kitchen Klatter story. Thanks for sharing the memory with us Tami. Have a wonderful day!! I loved this post Tami and couldn’t agree more. How wonderful will it be for our future grandchildren to read our words! My blog started when I was 40 years old and I am hoping that my grand kids will get over the fact that I swear like a truck driver! Well Biz I guess not everyone shares our love of cookbooks! Yes indeed you do swear like a truck driver – you make me laugh! From the pic it looked like peanut butter. But hey your third photo got me craving for this, I wish I could eat it just by looking at it, looks easy to make, let me try it too. Hey this looks very yummy! I can’t wait to try it–a new way to enjoy hummus!! Love hearing about Grandma Gritz–brings back lots of fond memories!! Glad you enjoyed the Grandma Gritz story – I sure do miss her!